Ben: Lou the Wrench? Why "the Wrench?" Paul: He twisted some guy's head off. Sequelitis is a sickness that has plagued Hollywood for years, and that's why I'm thankful for a movie like Analyze That. If the follow-up to a mid-level, mediocre comedy like 1999's Analyze This can turn out so terribly, and bomb so spectacularly, maybe the studios will finally stop trying to stretch flimsy ideas into franchises. Sadly, it may already be too late for Robert De Niro, who is slated to star in the patently unnecessary sequel to Meet the Parents. But you can save yourself, at least, and not rent this tired mobster spoof (since, judging by the box-office gross, you didn't see it in the theater). De Niro is actually the film's biggest problem. His dramatic prowess aside, he's simply not a competent comedic actor. Audiences and critics largely enjoyed the first film because it allowed De Niro to spoof his infamous tough guy persona as Paul, a mob boss with emotional issues who seeks guidance from jittery shrink Ben (Billy Crystal). But after nearly identical turns in the aforementioned Meet the Parents and The Adventures of Rocky and Bullwinkle, his act is wearing thin. The scripts don't give him anything funny to play with, we're just supposed to be laughing because he's De Niro, and he's spoofing himself. The results are "bits" like the recurring gag in which Paul, trying to prove he's nuts so he can escape from prison, sings tunes from West Side Story. De Niro doesn't do anything funny. He just sings. So I guess it's supposed to be funny because De Niro is singing, but it isn't, at all, even when repeated ad nauseam. The confusing, convoluted, and needlessly complex plot doesn't help matters. Once Paul convinces the prison doctors that he has lost his mind, he is remanded to the care of Ben, because the writers couldn't actually think of a logical way for the two to get back together. The best bits from the first film are rehashed as Ben's wife (Lisa Kudrow, sorely underused) grouses about having a mobster in her house, and Paul abuses his guest privileges by bringing home strippers and contacting his former "familial" cronies. Soon he's stuck between the new mob leader and the cops (who have threatened Ben with incarceration if he can't keep Paul under control), and the antics continue for 90 merciless minutes. Harold Ramis has made a few truly great comedies, but none recently, and it's always disappointing to see him falter (he co-wrote as well). Tonally, the picture is all over the map, moving from broad physical gags, to satire (the one good setup, Paul's new job as advisor to a Sopranos-style TV series, is never used to its full potential), to drama (I think... the misty flashbacks to Paul's childhood are so bizarre they might be intended as a joke). Warner Bros. expected big things from this movie, but it arrived DOA at the box-office, and with good reason�there was barely enough in the concept to support one film, let alone two. Hopefully they'll think twice next time. Probably not, though. Image Transfer Review: Analyze That's muddy visual style isn't pretty to look at, but I can't fault the transfer�this is more top-notch work from Warner. The image is very crisp, with excellent, natural colors and wonderful fine detail. Shadow detail and black level are both very strong. I didn't notice any artifacting or aliasing, but there is some occasional edge enhancement, though not enough to really hurt the grade (especially since I only see it when I really look for it). Audio Transfer Review: This DD 5.1 mix suffers from a sever case of front-heavy comedy syndrome�the surrounds are practically mute throughout (odd for a recent film). Dialogue sounds clear and natural throughout, and the score is played across the breadth of the front soundstage, though it is presented without directionality. Sound effects sound fine when they pop up, but even the gunfights and car chases sound a little bland. Not a bad mix so much as a boring audio design. Extras Review: Analyze That is another case of a money loser given the special edition treatment on DVD, but the extras are as lackluster as the feature. Harold Ramis contributes a dull commentary track full of the same bland comments I've heard on nearly every track I've ever listened too�comments on the story development, the on-set atmosphere, the locations�but he does so at a languid pace, with long gaps in between his scant remarks. It's a real snoozer, which turned out to be in my favor, since I was listening to it as I went to bed. 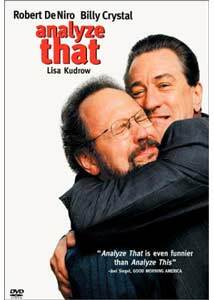 The 12-minute The Making of Analyze That is about what you'd expect�lots of film clips and PR interviews with the actors and the director, set to some snappy music. Nothing of interest is communicated about the filmmaking process, though it is kind of funny to hear the entire cast sing the praises of the film ("funnier than the first" is an oft-heard utterance). Rounding out the disc is the trailer, some brief cast and crew filmographies, and the Cosmo-style multiple-choice quiz "M.A.D.E. : The Mafioso Associate Degree Exam." Those of you who get your kicks from fiddling around with your remote can discover if you've got what it takes to be an Italian stereotype. Analyze That is the definition of the unnecessary sequel, and it's bad enough that I can't even recommend it to fans of the first one. Easily one of the worst studio releases of the year. Warner's DVD is mighty fine, though, proving that there is no justice in the world.